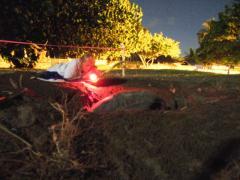 Yes, it was another night out on a Lahaina beach for these pooped Boomers. We were going to say "aging Boomers" but that would be redundant. We were now getting used to 5690's schedule and figured arriving around 9:30 PM at Kamehameha Iki Park would get us there when she made her first emergence. To our horror, a surfing event--complete with a huge projection screen, lots of people, and surfing music with a thunderous bass--greeted us as we opened our car door. Now what? How would 5690 take to all these people, lights, and activity? Then it became obvious that people were clearing out and cleaning up--that the event was over at 9:30, so we were grateful. Satisfied that the worst this Surf Event did was force 5690 to wait until there was dark and quiet, we strolled towards the beach to set up for a potentially long night. Ursula spotted a large round rock inching itself ever-so-tentatively towards the darkest part of the park. 5690 had stuck to her 9:30 emergence despite the surfin' dudes and their event! To our surprise and delight, 5690 got down to business and began work on a body pit right away. Unfortunately, she chose to dig so close to her last nest that we feared she'd dig right through to the eggs. An hour went by as we watched her dig down. We spent the time discussing how those doing the excavation of Nest 5 could steer clear of Nest 6. We were fortunate. We don't know whether she smelled her eggs from Nest 5 or what, but 5690 suddenly stopped digging, turned, and crawled about two metres away. We feared she was heading back to the ocean, but she began digging a new body pit--she'd simply shifted. This area was to her liking and she completed a successful nest. She began laying eggs at 12:37 am and by 3:30 she had returned to the ocean. 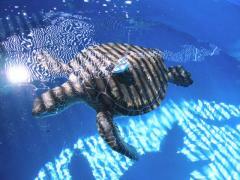 We were grateful this lovely honu gave us another early night. Will she make a seventh nest? We'll be back on the beach to find out beginning the night of August 18th. It's always terrific to have George Balazs visit us while we're here on Maui. This summer we had a special treat. 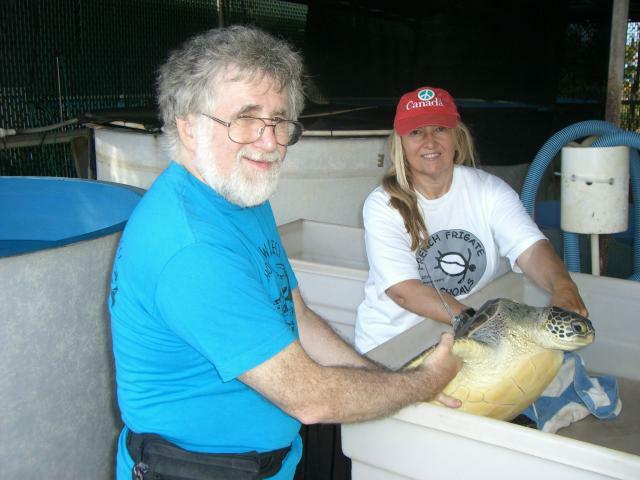 We were invited to watch George and JIMAR turtle biologist Stacy Kubis work with the crew from the Maui Ocean Center to prepare seven juvenile turtles for release the next day. 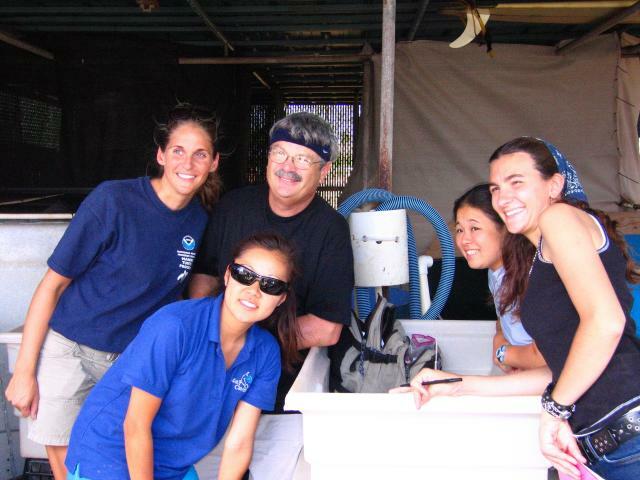 These little honu were originally captive-bred at Sea Life Park on Oahu. There was one turtle that--well, that the MOC people just fell for. Kimo was "different" from the others. Just did things slower than the others. Was a year older than the others. 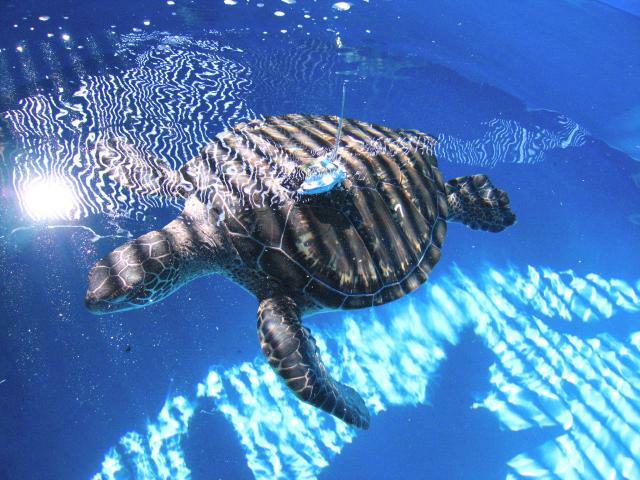 If a turtle was seen basking (catching rays) 90% of the time it would be Kimo, MOC staff said. Above all, Kimo had certainly won the heart of John Gorman, MOC's Head Curator. While everyone at MOC had a Kimo story, there was no one happier than John to have Kimo selected as one of just two juveniles to receive a satellite transmitter. This meant for John and the MOC staff that Kimo could remain a part of their lives until the transmitter sent out its last signal. After the transmitters were secured to each carapace, Kimo and Malia had some waiting to do. After all, fiberglass resins need drying time. The five other juveniles went through final preparation (PIT tags inserted, numbers mototooled, then painted on both sides of shells) under John Gorman's supervision. Peter and Ursula lower Malia gently back into the preparation tray. We got to use the PIT tag reader and wished there was such a thing that could be used underwater. 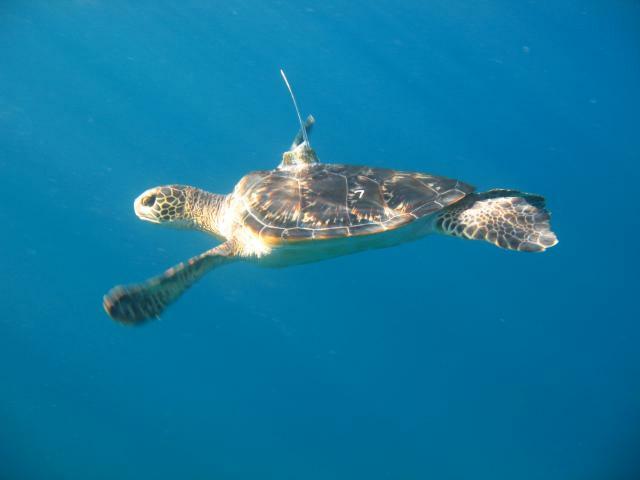 The MOC crew talked a lot of turtle story with us until a finger test of each transmitter showed that Time had fused device to carapace. Once the adhesives had dried, Kimo and his transmitter were put into a holding tank until Thursday, the Big Release Day. Here's our favourite photograph of laidback, special Kimo. Thanks to Josh Whittmer for this beautiful photograph of the release. For the first time in Kimo's life, the little honu could swim swim swim swim swim for as long as he wanted and in any direction. Water conditions have improved greatly around here--surprisingly so. It's like the full week of large swells that kept us out of the water the week before had actually scoured the ocean bottom clean. 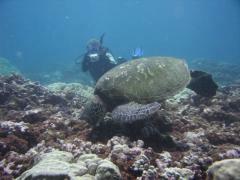 We did back-to-back dives at Kuamo'o to take advantage of the much calmer conditions. Kuamo'o is tempermental and dive conditions can sour even during our actual dive. 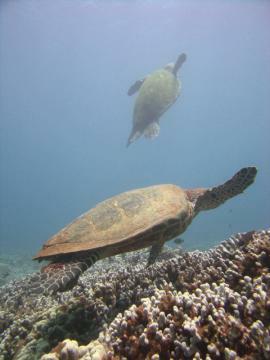 To our delight, on the second dive there we followed a young honu foraging on Amansia for about twenty minutes. 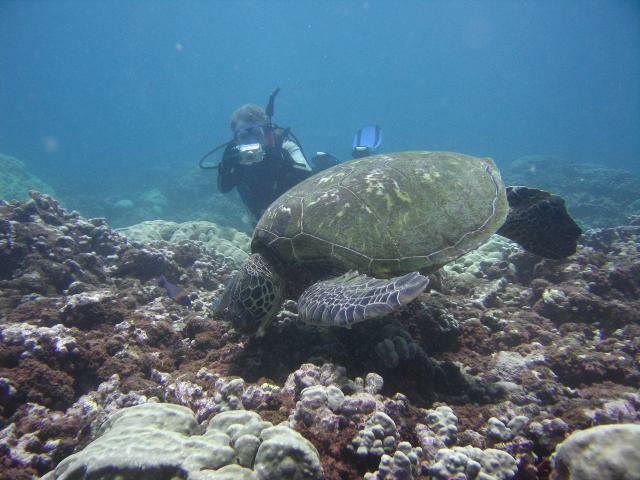 The area was thick with this limu, so any honu who finds this seaweed tasty will delight in an accessible and full pantry between trips to the surface for air. 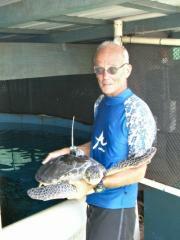 We both feel that the Kuamo'o turtles are doing much better as far as fibropapilloma prevalence is concerned. We see considerable evidence of regression--so good news! Now for the bad news. We see the hawksbill again--good news. It's concentrating on foraging--also good news. It's ignoring us as it beaks along the reef searching for sponges and other tasties. Also good news. It approaches a honu. Fantastic news! 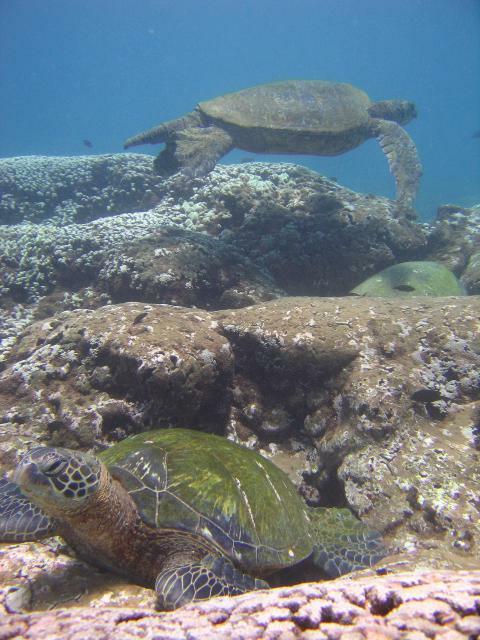 Ursula anticipates that maybe This Time she can get that Special hawksbill/honu photograph she's been trying for since 1999. The honu lifts for air as the hawksbill glides over coral and they're both in line for that perfect vertical shot! Ultra-mega-elation news!!! The result? So bad we want to file it under Murphy's Law.